With the initial symptoms of sub-mandibular adenoma and rise of jaundice and hepatic enzyme, I was diagnosed with autoimmune hepatitis(AIH). But I am recovering well now. Medicine could save you but could never cure you, so I improved my dietary habits. Injection of Stronger Neo-Minophagen C has been started. And every morning, the nurse will come and give me a hole on my arm. It does not hurt so much, but it always make me fear. But I am always waiting for it. Because it is the only medicine to cure my liver jury currently. And the result has come out as following. On 28-12, the doctor told me that, I should left the hospital, because the improvement is confirmed of (ALT and AST). But the trend is getting smaller, I just worried about it. And I asked. And the doctor answered that, because the reason is not clear, maybe it is because of some medicine stayed in your liver, and you should wait for it being excreted. Honestly, I do not agree with it so much, I just felt something uncertainly and danger in my body. But I hope things is changing as the doctor saying. Another reason that I felt danger is that I have studied the function of Stronger Neo-Minophagen C. It could not cure the disease but to make the cellular of liver stronger and delaying the destroying of liver. If ALT and AST could not get into the safe range, and stoping the Stronger Neo-Minophagen C also, it must rebound. Let's wait and see. I hope I will never come back to live again in hospital. Another point in the result is G-GTP. It is just growing. Maybe it is because that I have eat so much beaf and eggs and milk, I don't know. 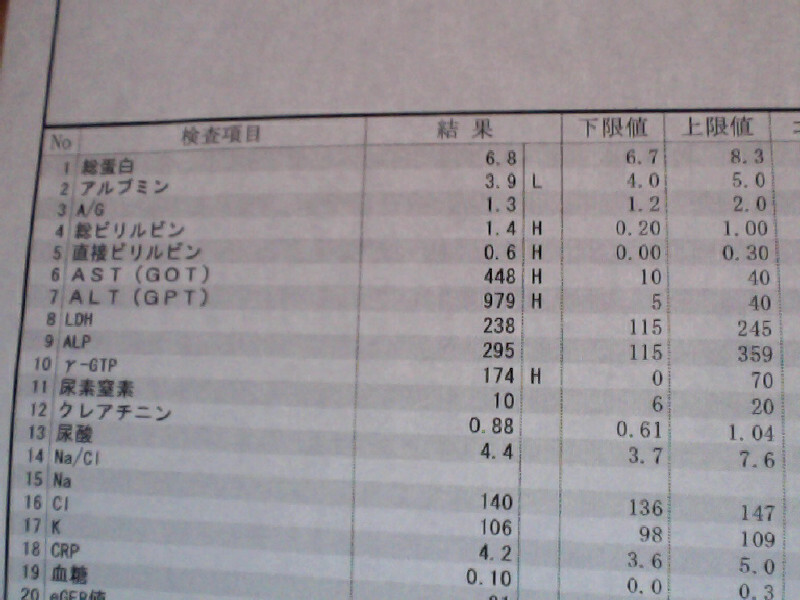 This is today's blood test result. Yesterday and the day before it, nothing changed so much on my body, maybe a little bit tired easily. Before I lived in hospital, I ususally go to sleep about 24 oclock. And now I still can not go to sleep before 24 oclock. I just thought I have nothing serious. (But friends don't treat your body like me) My little poor liver is crying, but I still could not give it a early sleep. So the situation could not be better. And today's morning, nurse came and take some sample of my blood. I just asked her, can the result changed to be better immediately? She smiled and answered, I do not think so, but some improve maybe confirmed. Just as what she said, improvement is confirmed, but so little, and from the doctor, it is equal to nothing changed. And the doctor's conclusion is wait and see, and blood test again 2 days later. The first day in hospital is Saturday. The Doctor do not work, and with other patients I am just laying on the bed. Waiting and praying. But there is not obvious symptoms, and I just felt strong. If I have not been found out with liver injury, I may be playing tennis today. From now on, maybe several weeks, I can not go back to tennis courts. I misses and admires my friends. Wy wife contacts my best friends about my illness, and they promise to come to see me. But not today. Yesterday evening, the doctor comes and told me that I should rest in bed avoiding any heavy work or sports. And the next blood test will be carried out on next Monday. Is there any medicine I should drink? I asked. He told me, nothing! I really can not understand the answer? what is the meaning for me to live in hospital. Just waiting? And I asked like that. And He answered me, that it is to avoid cases of some emergency. And some other blood test results has been out as follows. Can you understand living in hospital without treatment? I now understand that, there are so many reasons may make over liver sick. Virus, medicine, alcohol, fat. Without the reason is cleared, any medicine may make situation worse. So in the beginning, rest and check is most important. At least I went begin to live in the hospital. And this is the first time in my 33 years life. My feeling is complicated. You know, in the beginning of hepatitis, it is always without any symptoms. In fact I still do not believe I have caught this disease. So I start to search the keyword of hepatitis in the internet, there is a lot of explanation, and I come to know the variation of it. But all of them is horrible. And I come to understand the importance of the liver. But what kind of hepatitis I have caught is still a question. I hope I do not caught B or C type or AIH. If I really caught it, I hope it will be A type. But obviously, I am not, because I do not have the symptoms of A type. And maybe drug-induced liver injury? Because I just read a issue of a women died of drug-induced liver injury, I am just afraid. 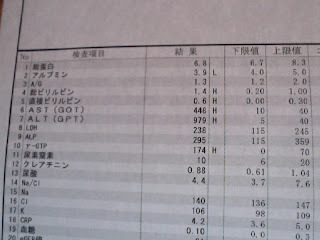 In the evening, the doctor comes and give me the blood test result as following. As to my room, it is good, and I can see the morning sun, it make me felt good. After hang up the phone, my wife and I just rush to the hospital. Without any words, my wife is just worrying about me as same as myself. And I was called and went into the consulting room. But no doctor is there. So I am just waiting. But there is a computer and the display is showing results of blood sampling with the conclusion of "disease of liver". That was just a shock to me. I could never believe I could get such a disease. I used to know that disease on liver will always be a huge damage to human body. Mostly people will carry the disease all their lives. So, I was just felt sorrow and disappointed. For about 40 minutes, a young man as the Doctor comes and start the explanation. "Go to the examine bed please. " The Doctor asked me. "Can you feel any pain here? and here? " The Doctor pressed on my stomach and asked. "No, I can feel nowhere pain." I answered. "OK, please get up." The Doctor answered. From your blood test, we found that you may have caught a heavy hepatitis. And we need you enter into the hospital immediately. "Oh, my god, that will be my first hospital life in my whole life" I thought. "But, there is no symptoms, maybe a little bit tired." I answered. "But, from the evidence of your blood test, you are obviously catching the hepatitis, and some time there is no any symptoms, but sometime the disease will proceed very fast, sometime the life may be in dangers." The Doctor answered. "OK, I see." I answered. "Have you eaten some grilled meat of steak?" The doctor asked. "I am not so sure." "Ok, Please look at your results of the blood test." "The value is more that normal about 20 more times. And I am worrying the value will increase continuously, so you should go to bed and just relax yourself, and do not give your body any load please." The Doctor said. In fact after hearing those words, my head is totally white and could think nothing, I have planned a lot in the new year and I have applied a tennis match with my friends. All this plan must be cancelled, life seemed will have no interests from now on. My wife go to do the paper work of living in hospital, and tell me "just relax think nothing and take a good rest please". I can see she is worrying me from her face. About 1:00 the middle of the night, I wake up suddenly, and found that my submandibular gland is swollen, and the small sublingual gland is bigger than normal. About this three weeks, my sublingual gland swelling in the middle of the night, and the submandibular gland is always big, but they will decreases when I got up in the morning, it was just a repetition. Yesterday I have request the rest from my boss to take a examine in hospital. But last night it is just repeated and I woke up at 1:00 until 3:00 and sleep again in the morning. And I waked up at 8:30 morning, sublingual gland was smaller, so I go to the hospital. Since it is the first medical examination without reservation in advance I have been waiting about 2 hours. Finally it is my turn, and I entered the room, doctor of a young lady , it was quite displeased face because of busy. After describing the symptoms, the doctor just gave me a judgement that no illness. "I think only the submandibular gland is swollen, no heat, salivary stone also can not be detected by palpation, let's wait and see for a while"
"But, submandibular glands are still swollen, there must be some thing illed there" I asked . "If you worry, think I can arrange a CT scan for you" she answered. "A blood test to confirmed the inflammatory seemed to be necessary" a old nurse beside the doctor said. Then, the arrange a CT examination and blood sampling. And I was told that results of the test will come out a week later, and I just went home. But after finished the lunch, about 15:00, I received a phone call. "The results of the medical examination is out, please come." You have told me the results will be out after a week, why now? I thought some thing must be emergency, and I felt very anxious. Travel theme. Theme images by borchee. Powered by Blogger.